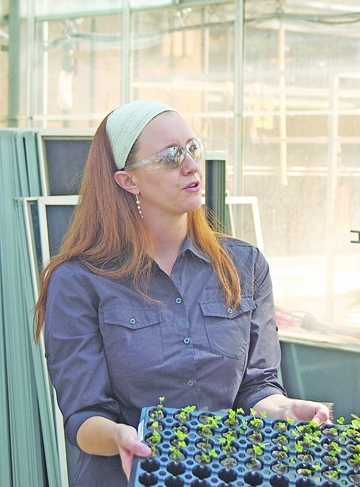 Scientist Megan Dickens takes sprouted plants out of the lab and grows them in a series of greenhouses on site. If you want to ruin a dinner party, just bring up Monsanto. Like politics and religion before it, the world’s largest seed company is a topic notorious for starting arguments. To critics of Monsanto and the genetically modified (GMO) crops it develops, the company is a money-grubbing force for evil, poisoning the food supply and stomping on small farmers and environmentalists who get in its way. Those two camps are firmly entrenched, thanks in large part to the Internet’s bunker system. Those who believe the ethical and practical questions raised by GMOs are a bit more nuanced have been largely silent on issue, at least online. But outside the vortex of vitriol and rhetoric that surrounds this company, there is one indisputable fact: Monsanto is a scientific research and development entity that has been at the forefront of a fundamental change in how crops like corn, cotton and soy are grown. Globally, the company has more than 400 campuses and 21,000 employees. But it was right here in Middleton that the first “Roundup Ready” seeds were developed. Today, those seeds are growing on hundreds of millions of acres across the globe. It all started 10,000 years ago, when humans began domesticating crops by selectively breeding them. By the 1700s, farmers and scientists were crossbreeding plants within a species. Then, in the 1980s, researchers worked to find ways to introduce genes from other species in an effort to improve crops yields and bolster disease resistance. Using a cobbled-together device that included part of a .22-caliber firearm, researchers essentially bludgeoned a new gene into the genetic makeup of another crop, and in the 1990s the first GMOs were introduced onto the market. The early scientists, who were so close to those first individual plants they gave them each names taken from science fiction characters, made many of their first breakthroughs at a company that was founded as Cetus in 1981 and later purchased by Monsanto in 1996. The company has spent an estimated $7 million on improvements to the Middleton campus over the last three years. The tour walked guests through the facility, guiding them through the process that Monsanto (and other biotech companies) use to genetically engineer crops that tout traits such as drought-, pest- and disease-resistance and higher yields. It was first demonstrated in tobacco in the early 1980s. While labor intensive, the process is actually fairly simple, at least in theory. If scientists want to create a type of wheat that will survive the increased temperatures and lengthy droughts that could accompany global climate change, for instance, they seek out other species of plant that thrive in deserts. They extract a gene - or a combination of genes - from those plants, and inject them into a wheat embryo. The devil, according to researchers in Middleton, is in the details. It is through painstaking trial and error that scientists find out which genes will - or usually won’t - work. Throughout the process, the seeds, then the plants they grow into are digitally tracked and meticulously observed. Eventually, the next generation is shipped to warmer climes, where it is grown and evaluated again. The seeds and plants glimpsed by those touring Monsanto last week are at the very beginning of a journey to the marketplace that could take as long as 20 years, according to Frey. “You’re seeing the future,” he stated. And it wouldn’t be much of a future without particle guns, centrifuges and bright pink, wavelength-specific growing lights, all of which were on display last week. They also utilize “reporter genes,” which turn parts of the plant blue to indicate the presence of genetic changes. The device utilizes a quarter of a lightning bolt worth of electricity in order to blast genes into their new homes. Martinell said the procedure is similar, in some aspects, to gene therapy in humans. Scientist Megan Dickens takes sprouted plants out of the lab and grows them in a series of greenhouses on site. Leading the tour through a particularly balmy enclosure where various species climb and spread out their leaves, Dickens explained that each flat of plants is carefully coded for tracking. On the final stage of the tour, scientist Mike Peterson explained how researchers extract DNA from the grown plants, analyze it, and help determine if the new genes have done their job. From start to finish, researches can test tens of thousands of leads before coming up with a single licensable one. The cost of bringing one GMO crop to market, according to Frey, is between $120 and $150 million. Monsanto is also busy in the community. The local facility heads up a community advisory panel including chamber of commerce executive director Van Nutt, city council member Gurdip Brar, police chief Chuck Foulke, Middleton Outreach Ministry Food Pantry director Cheri Farha, and Middleton-Cross Plains Area School District community relations specialist Perry Hibner. The company has donated to local groups, including the Friends of Pheasant Branch, which Monsanto gave $8,400 for environmental education. Those donations, and last week’s tour, are part of an effort to counteract some of the criticism the company has received. Frey said is can take a highly trained scientist decades to fully understand GMO research and development. He contended that further educating the public will alleviate some concerns about Monsanto’s work.